A map of potential bike routes connecting downtown Salt Lake City to the University of Utah. June 23, 2016 – Salt Lake City is working towards completing the Downtown to University of Utah Bike Route. The initial step was completed in 2014 with the addition of the 300 South protected bike lane from 300 West to 600 East. The route, when complete, will provide a low-stress way for commuter cyclists to travel to the University – the most popular commuter destination in the state. The route is also part of the newly passed Salt Lake City Pedestrian and Bicycle Master Plan. Interestingly, it does not appear that the protected bikeway will be extended past 600 East. The protected bike lane has lead to 30% greater use by cyclists, and 8.79% greater sales receipts by businesses along the corridor. Three route options are shown on the map. 300 South forms the backbone of the route from 300 West to 1000 East. Borrowing from skiing rating systems, the green/easy route will go north on 1000 E, then east on 200 S, and then deviate to Bueno and back to 1200 East and back to 300 S. The more difficult/blue route will follow 300 S to 1100 E to 400 S to the U, thus avoiding the dreaded 300 S hill between 1100 E and 1200 E. Note that 1100 East is on the East Bench Fault Line, part of the Wasatch Fault which has led to the formation of the Wasatch Mountains through tectonic activity. The third option is 300 S to 1000 E to 200 S to the University. This is rated black diamond/most difficult since riders must ascend 200 S. With no plans for a bike ladder, this will remain a difficult climb for most. Salt Lake City is reaching out to you to seek your input on a project in your neighborhood. Salt Lake City will be installing the next phase of the University to Downtown bikeway. This section will be a simple, paint-only bikeway on East Central neighborhood streets. The project is currently in design, and anticipated to be constructed late this summer. • On 300 S (600 E to 930 E), the pavement will be maintained with a slurry seal. • Once maintenance is complete, a new striping design will include one lane in each direction, a center turn lane, and bike lanes. This design improves safety for all roadway users, and will accommodate both current and future traffic volumes. • Other blocks will receive pothole patching followed by bikeway painting and signs. • No physically separated bike lanes (e.g., no concrete). Get the project overview, look at details, and give us your input. Come to the meeting nearest you, or whatever one works for your schedule. We picked locations with nice, shady trees. • Tuesday, June 28 – 300 S at 1300 E (northwest corner), 6-7 pm. We will ride up the green route (less steep) and back down blue. • Wednesday, June 29. Meet 300 S at 600 E, ready to ride, 6-7:30 pm. BYO bike, helmet, & drinking water. 3. Find out more and give us your input online. The website includes block-by-block drawings of the project, and an overview of the project’s history and public involvement to date. Your input is requested by Tuesday, July 5. The Downtown to University of Utah Bike Route is a greatly needed project, and we are excited to see the next steps taken towards completing this bike facility. The three alternate routes are a great idea that will give students, faculty, visitors, and employees a better way to get out of their cars and on to their bikes to get to the U. The route also sets the stage for GreenBike to have a University Station. Although we know of no plans for this at this time, GreenBike would be a great addition to the commuter environment at the U. 300 South forms the backbone of the route to the University. The 300 South protected bike lane is a great addition to cycling in Salt Lake City (despite the opposition by a few business owners and a few vocal vehicular cyclists). It provides a separated facility where commuters and slower speed riders are not having to mix it up with heavy downtown traffic. Given that, it's extremely disheartening to us that the protected bike lane is not planned to be extended to 1100 East. This seems to us to be a big step backward for cycling in Salt Lake City, especially given the successes of 300 South and 200 West. Protected bike lanes are the future. They are changing the face of cycling throughout the world. Salt Lake has been on the leading edge of this change with its trendsetting 200 W and 300 S protected intersection. Why are we stepping back now? Given our air quality, health, and traffic issues, continuing the route as a protected lane should be a no-brainer. 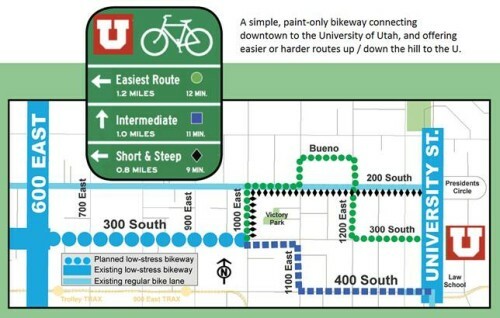 From Salt Lake City's webpage on the project, the UtoDT Bikeway is supposed to be a low stress bike route, “A low-stress bikeway will enable more people to travel between the U and Downtown by bicycle. The connection between the University and Downtown was started in 2013 with the identification of 300 South as the preferred corridor, followed by construction of the 300 South bike lanes in 2014.” While we are proponents of standard bike lanes, they do put the cyclist closer to traffic, and if not constructed properly, can place the cyclist near the ‘door-zone' (area where parked-car doors can open and cross the path of the cyclist). Why then is this being considered a ‘low-stress' bikeway? This seems to be contrary to the Pedestrian and Bicycle Master Plan too. Buffered bike lanes would also be better here than standard lanes. Buffered lanes provide an additional paint stripe on one or both sides of the lane and more clearly demarcate the lane for both cyclists and vehicles. At the time we published this, we don't have information on whether or not this project will include them. In looking at the block by block design, narrowing the traffic lanes and center turn lane and parking lanes would provide room for a buffer between bikes and traffic. The Pedestrian and Bicycle Master Plan defines a low stress route as follows, “multi-use paths, protected bike lanes, buffered bike lanes, and neighborhood byways.” (Page 24) Clearly, since 300 South is busier than a neighborhood byway, it should get either a protected bike lane, or a buffered bike lane. This extra level of bike lane infrastructure will no doubt lead to more ridership. A recent survey by Salt Lake County showed that cyclists prefer buffered bike lanes over regular, single-stripe bike lanes. We look forward to seeing the design and implementation progress. One Response to "Salt Lake City Looking for Feedback on Downtown to University of Utah Bike Route"